Iblis Phase 1 is Silver's first boss in Sonic the Hedgehog (2006). In what is apparently a "typical day in the future" for the psychokinetic hedgehog, he and Blaze fight through the burning ruins of Crisis City in order to confront their immortal adversary once again. 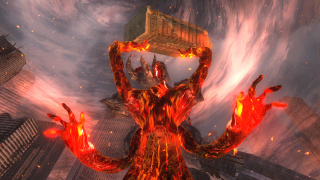 In its first phase, Iblis is perhaps at his most demonic-looking; a four-armed fire monster bearing a mantle of smouldering rock, who periodically picks whole buildings up out of the lava to smash down on Silver and Blaze. Nonetheless, the battle is relatively simple; Silver must simply run back and forth along the broken causeway, picking up chunks of rubble with psychokinesis and lobbing them right at Iblis' face. The beast's rocky armour gradually falls off, making Iblis diversify from building-smashing and occasional meteoric bombardment to flamethrowing the whole platform. Simply keep lobbing objects to chip away Iblis' health bar to zero. In the cutscene after the boss fight, Mephiles makes contact with Silver and Blaze, eventually sending the two of them back in time to assassinate the one responsible for releasing Iblis in the first place - one Sonic the Hedgehog, the Iblis Trigger.